The James M. Robb-Colorado River State Park is located in Mesa County in Western Colorado. Named in 2005, after James M. Robb, to honoring Mr. Robb for his civic involvement in Mesa County, as well as, his support for creating this park with five sections along the Colorado River. The eastern section is located in Debeque Canyon, right on the River, with the western section located in the town of Fruita, a gateway to Colorado National Monument and the McInnis Canyons National Conservation Area. All five parks provide Colorado River access for kayakers, rafters, canoeists, and those using tubes on the river. 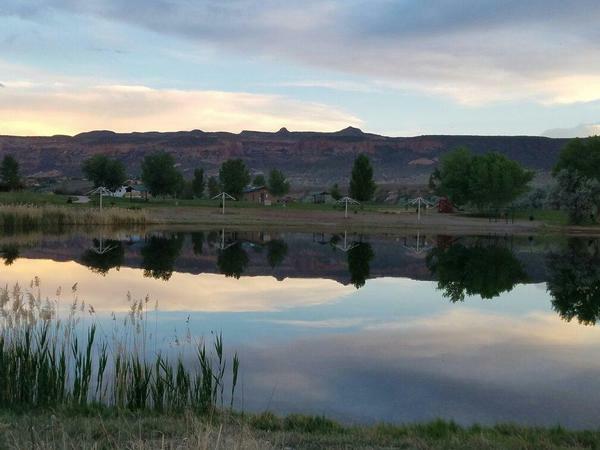 For paddling, the distance between Corn Lake and Connected Lakes, as well as the distance between Connected Lakes and the Fruita section is approximately 10 miles with a float time of 3-4 hours. Camping is available year round, with shower and laundry facilities open from the Spring through the Fall. Just east of Palisade on I-70 (exit 47) in Debeque Canyon. Camping is available year round at Island Acres with 80 sites in four campground loops. The camp ground has full hookup with 40 sites, as well as electric only RV hookup with 34 sites, with 6 tent camping sites. With this sections proximity to the interstate, road noise as well as train traffic noise can be heard from the camping area. Island Acres has four lakes, with three for fishing (one stocked with trout) and the fourth lake for swimming (with a sand beach). The Corn Lake Section, on the northern bank of the River on 32 Road, just south of Clifton in Mesa County. This section is a day use only park, and also serves as the Park Headquarters. Corn Lake has a launching site for boaters, with options for hiking, fishing, and bicycling. Corn Lake has both warm and cold water fish, being stocked with Black Crappie, Bluegill, Largemouth Bass and Trout in the spring and fall. The Park is open from 5 am until 10 pm, with the Park Office being open from 8 am until 5 pm (except for government holidays. During the summer and big game season the Park Office offers extended hours. This section is located one mile to the West of Corn Lake, on D Road. Biking, hiking, and wildlife viewing are the primary activities. Boating is not available. None of the lakes in this section are stocked with fish, with fishing prohibited on Bestwick Pond. The Connected Lakes Section is a day use park, opening daily at 5 am, closing at 10 pm. Located off Broadway (State Hwy 340), take Dike Road to the southern part of the section. The River Trail (City of Grand Junction) and viewing area on the north side of the Colorado River is located off of the Redlands Parkway. River launch site for boaters and paddlers. Trail network with wildlife viewing, biking, and hiking. Boating with electric motors only used in the ponds. The Fruita Section is located just to the south, .5 mile, of I-70 in Fruita (exit 19) on the Colorado River. This section is just north of the Colorado National Monument, and west of the McInnis Canyon’s NCA. Pay showers and laundry services are available from the middle of March until the beginning of November. The Fruita Section has a visitor center with bookstore. Playgrounds for children, with walking distance to the Dinosaur Journey Museum. Restaurants and shopping are within walking distance. Fishing and boating with non-motorized boats on the lake.